"California's original ski area" is ready for its snowy, season-sweet opening. Yosemite Ski & Snowboard ready for its snowy, season-sweet opening on Thursday, Dec. 20. SNOWY SNAPSHOTS, the sort of photos that are absolutely covered in a thick layer of frost, the type of pictures that have you reaching for the nearest cardigan, tend to start popping up, on California social feeds, just before Thanksgiving. And if you've been watching for these cold 'n crisp windows into the wilder parts of our state, as it dons its brrr-illiant coat of snow, you've likely seen some well-known landmarks in the mix. YOSEMITE SKI & SNOWBOARD AREA... opens, as it will again, for another sporty season, on Thursday, Dec. 20, 2018. "California's original ski area" is not located in Yosemite Valley, or adjacent to El Cap or Half Dome, but it is a place where the skiing and riding can be sublime. We're schussing into the area's 83rd season, and the first place you'll want to head, we do imagine, is the Nordic Center, where you can set up your snowshoe rental (or, yes, your cross-country rental, if that's your preference). SNOW TUBING... isn't quite open yet, nor is Terrain Park, but look for the main slope-focused part of the destination to hum throughout the holidays. The lifts are open from 9 a.m. to 4 p.m., and the ticketing and rental shop open a half hour before the lifts. 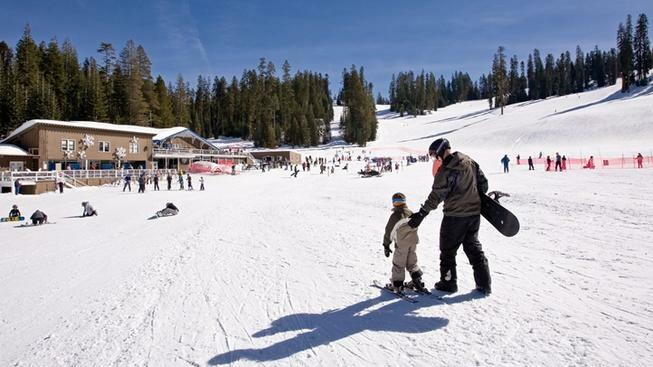 Oh, and there are five lifts to look for, as well as "10 slope runs of varying difficulty," not to mention "100 miles of stunning cross-country skiing and snowshoeing trails that originate from the Yosemite Ski & Snowboard Area." SO Y NOT? Well, why not, indeed? Yosemite is one of the historic snow-splendid spots for Golden Staters, and the fact that it rocks its own fun 'n frosty place only adds more panache to the park, as if such a thing were possible for such a panache-ful place.